We all need a little study motivation sometimes. With the new semester ramping up, you’re probably already overwhelmed by the assignments you’re getting. But that’s okay, if you’re already feeling the procrastination setting in, we’ve got you covered. 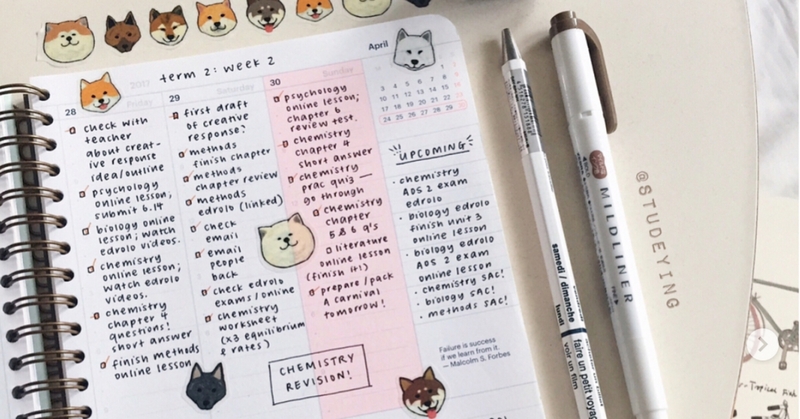 Check out these incredible Instagram accounts or as the community calls it (studygram) for all the study inspiration you could need for this semester! Sarah is from Melbourne and she posts tons of her beautiful spreads and her handwriting is perfect! Not only that, she also posts lots of different school supplies, if you’re a stationery lover, do follow her! Just look at that, isn’t it beautiful? Mia is a Malaysian science student and she is all about washi tape and muji pens. Just think gorgeous calligraphy and rose gold accessories. Everything about this account is perfect. If you’re into fancy stationery, clean aesthetics and bullet journalling (and if not, why not?) then this is the account for you. This young instagrammer keeps things pretty and plain in neutral colours. Primarily using black and white pens, and she usually pairs her planners with coffee, breakfast bowls, and other things millennials love. All these studygrams are stationery lovers with beautiful handwriting, and you just know that all their school notes look like something out of a museum. So anytime this semester when you’re not motivated to study, or your notes start to look like they did when you were in eight grade, start following these gorgeous accounts and get your notes in shape! Sevenpie wishes you all the best going back to classes and study hard.